Woo Hoo! 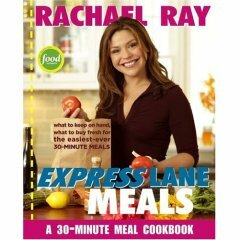 A new Rachael Ray book is on the way: Rachael Ray Express Lane Meals. One of my favorite things to obsess about is what to make for dinner. Rachael Ray has become the usual solution for this question. A whole new book means a whole new bunch of recipes to try. For some reason, I hardly ever make the same thing twice, so I am always looking for new material. This one says it is about "What to Keep on Hand, What to Buy Fresh for the Easiest-Ever 30-Minute Meals." Sounds like it's right up my alley. I look forward to the reviews saying how much she stinks. Whatever people. Some of us just like yummy food that is easy to make and is from mostly fresh ingredients. For some reason she gets under the skin of a ton of people, but I love her! And yes, I do have subscription to her magazine. Try the Gaucho Cheesesteaks, they are outstanding!